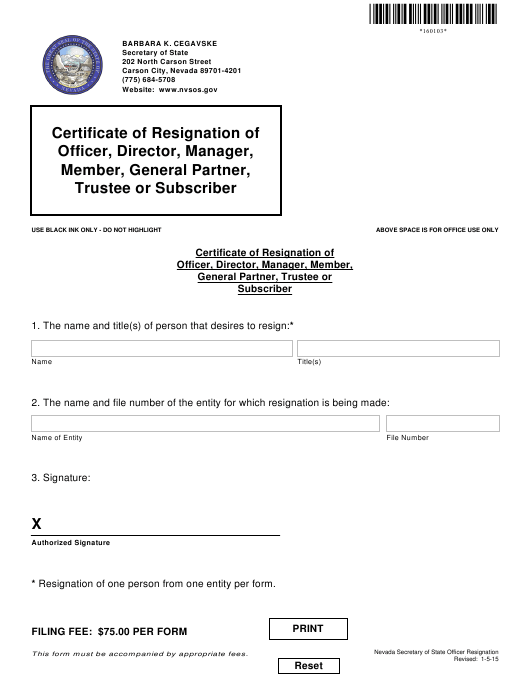 Form 160103 is a Nevada Secretary of State form also known as the "Certificate Of Resignation Of Officer, Director, Manager, Member, General Partner, Trustee Or Subscriber". The latest edition of the form was released in January 5, 2015 and is available for digital filing. Download an up-to-date Form 160103 in PDF-format down below or look it up on the Nevada Secretary of State Forms website. * Resignation of one person from one entity per form.